Forza Horizon 4 is the latest entry in Playground Games’ acclaimed open-world racing series for Xbox One and Windows 10 PC. With its announcement at Microsoft’s E3 2018 Media Briefing on Sunday, June 11th, I was fortunate enough to receive an exclusive hands-on demo with the game shortly after its reveal in Seattle, WA at Turn 10 Studios – the home of the Forza Franchise. I was technically there for the 2018 ForzaRC Series 1 Playoffs, which saw Noble Esports’ newest recruit Robin ‘bbbb0x’ Betka take the lead in Forza Motorsport 7 that weekend and bring home $15,000 – but before all of that would happen, I had the chance to go hands on with the all-new Forza game codenamed internally as ‘Sunrise’ launching on October 2nd this year alongside the qualifying ForzaRC Series 1 finalists. My hands-on time with Forza Horizon 4 featured a walkthrough of the E3 2018 showfloor demo, but with an added bonus – the inclusion of Dolby Atmos surround sound, so I could pinpoint the exact location of everything happening in the open-world around me. Be it the sound of other V8 engines racing down the sweeping countryside roads of Great Britain in Autumn or the roaring noises from extreme off-road motorbikes in the middle of a forest at Spring – the addition of Dolby Atmos is a welcomed addition to the Forza Franchise, and Forza Horizon 4 is a great showcase for this revolutionary audio technology. The E3 demo for Forza Horizon 4 is packed with all sorts of new additions that highlight everything Playground Games is integrating into its upcoming open-world racer, with the headlining one being Dynamic Seasons. After a few minutes of driving through beautiful, historic Britain, you’ll be greeted to all four seasons as they’re expressed in the game. 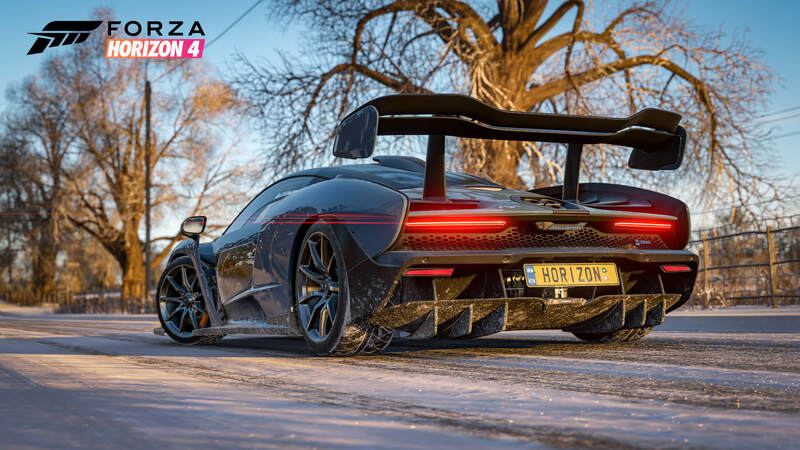 From blasting through leaves scattered across the road in Autumn to sliding across muddy pathways in the forest at Spring and even racing over a frozen lake in Winter – Forza Horizon 4 has it all for you to discover, and as the tagline says, Seasons do in fact change everything. Britain is a location that surprised many, but it’s a country full of beauty and variety that goes perfectly together with Seasons. It’s almost like they were made for each other. If there’s one thing people in Britain talk about far too often – it’s the weather, but it’s often because of how diverse it can be. 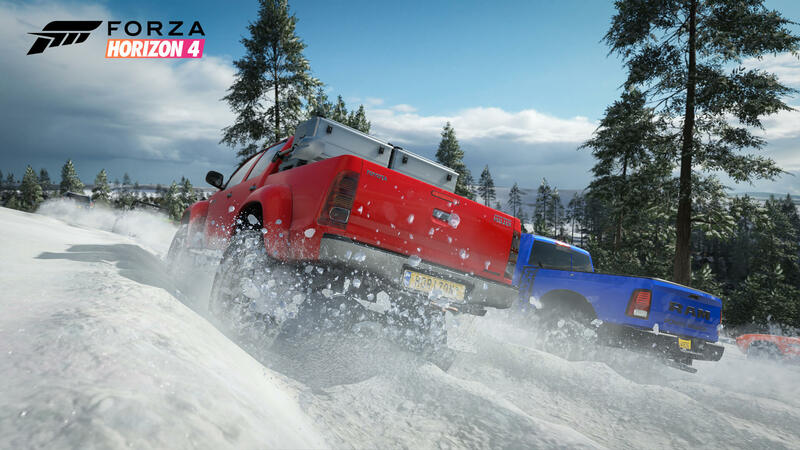 From heavy snowfall and storms in Winter to the extreme Summer heatwaves, the weather in Britain is about as varied as you can get – and Forza Horizon 4 authentically replicates this, but it’s no surprise when you consider Playground Games is based in Leamington Spa, as well as their masterclass execution of the land down under in Forza Horizon 3. The E3 demo for Forza Horizon 4 begins with a choice of three beautiful, unique and equally-wonderful vehicles. There’s a Porsche Cayman GT4, a Dodge Viper ACR and of course, the Forza Horizon 4 cover star, the McLaren Senna. 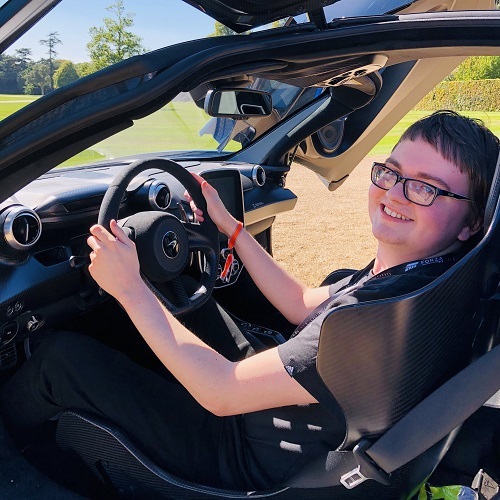 Boasting 700-horsepower complimented by adjustable aero and McLaren’s precision-focused handling, it’s everything you’d expect from the British supercar manufacturer and it naturally had to be my pick for my brief hands-on time with Forza Horizon 4. Soon enough, I was blasting out of the parking lot of a local British pub before hitting the roads of the Lake District in Autumn. Beautiful lakes and vast mountains surrounded me as I shredded through the Autumn leaves and took the lead ahead of the other supercars in this exhibition race event. There were a couple of bumps and near misses as I became accustomed to the game’s refined handling model – and felt the pressure of being watched by Turn 10 staffers, as well as the ForzaRC drivers, who are undoubtedly the best of the best when it comes to playing Forza! Not only did I immediately pick up on the diverse number of colours on show – being Autumn, the reds, oranges and yellows were at the forefront of the experience, and it’s certainly noticed on the trees beginning to fade and wither with their changing colours, but the improvements made to visual and texture quality had me reeling in excitement. Forza Horizon 4 looks absolutely stunning and its increased draw distance and improved quality means every detail looks crisp, clear and natural. As the song in the reveal trailer put it, I could see for miles, and miles, and miles. As I blasted through the English countryside at over 200mph in my McLaren Senna, which for the record handles like a dream, I might have ended up knocking down some old, historic stone dykes. These are hundreds of years old, and I apologize to the local farmers for any inconvenience this may have caused, as well as for almost running into your sheep! Despite being aware of sheep being present in the demo, I almost forgot about them during my playthrough – they’re a nice surprise that add to the overall homeliness of the location and I’m sure many will try to herd them once they get their hands on with the game. There’s also chickens, birds, deer, rabbits, crows, and grasshoppers to be found across Forza Horizon 4’s incarnation of Britain, but you obviously cannot run them over. 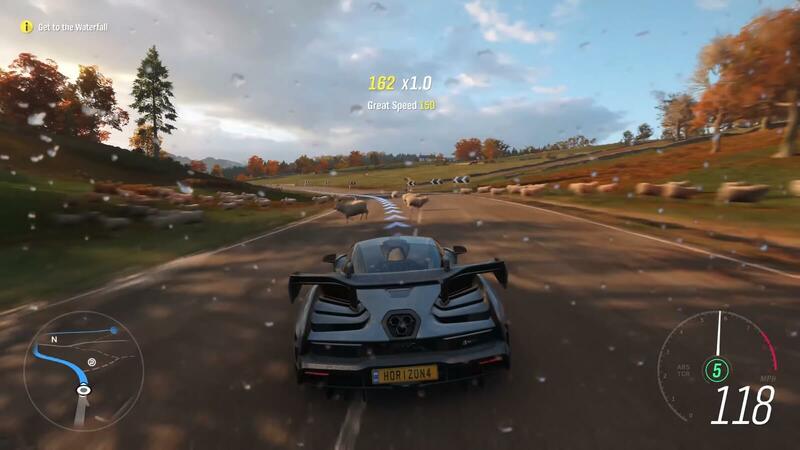 Developer Playground Games has implemented some wizardry technology here to ensure they can never be hit by your car – even when driving at over 200mph. At the end of the day, Forza Horizon 4 is a game that’s targeted towards everyone, so this is a good thing – but how the technology works that powers it all is quite fascinating to say the least. No matter how hard you try, you cannot run over those sheep! There are plenty of fences, walls, and shrubbery that can be dismantled using your car, however, should you desire some destructiveness when driving. Once I had driven my Senna down some of Britain’s best country roads – amassing a few unwanted scratches along the way, it was time to head beyond the Lake District and into a new season. Snow began to encompass the world and I was immediately taken out of my exotically lavish supercar and placed instead into an RJ Anderson Trophy Truck. Not only is this perfect for the off-road, but its grip and handling makes its essential for the brutality of snow, ice and blizzards in Winter. The Forza Horizon 4 E3 demo is divided into four challenges – one for each season, offering a small sample of some of the activities players will complete in the full game. Autumn saw me race towards three stars at a Speed Trap using the Senna, Winter requires a successful top-3 position, Spring sees you landing a big air jump amongst some dirt bikes, whilst the final sprint in Summer tasks you to beat the other supercars to the finish line. Forza Horizon 4’s E3 demo dubbed these as Forzathon challenges, which makes sense when you consider how Forzathon Live in the full game will offer similar challenges to beat on the hour with prizes to unlock for the entire community in your Horizon Life online session. Seasons also made each of these E3-themed challenges and their respective areas of the map feel vast and unique, and the second of these to compliment a snowy Britain is dubbed ‘A Song for Ice & Tires.’ It’s the perfect name because tackling Winter in Britain requires a lot of grip and precision. One of the first things I observed here were the frozen lakes – which serve as part of your slippery track in the demo. These lakes certainly aren’t frozen over in other seasons, but in Winter, they’re rock-solid. 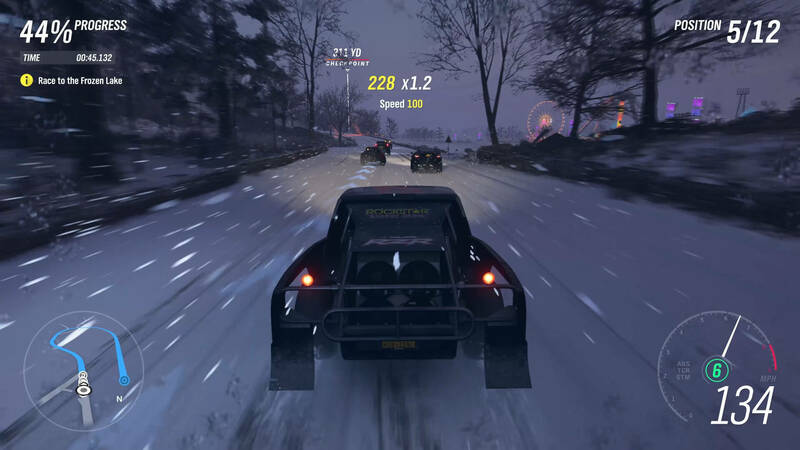 Of course, the roads are also snowy and icy, and after driving the RJ Anderson Trophy Truck for some time, I noticed the improvements Forza Horizon 4 has made to its off-road handling. There’s a much greater distinction between on-road and off-road driving in Forza Horizon 4. Tires have a better connection to the road in Playground’s latest racing game, and as a result, off-road vehicles feel more exciting to drive. There’s a lot more bite to them than before and with Forza Horizon 4’s ever-changing seasons, I feel like they’re going to be used a lot than in previous titles. Off-road vehicles were always my favourite in Forza Horizon 3’s Blizzard Mountain expansion, and I think the same will certainly be said for Forza Horizon 4’s Winter conditions. One neat little side effect of Winter time are the hidden locations that are now accessible thanks to the frozen lakes. These will provide players with access to spots they can’t get to during the rest of the year – including access to previously unattainable islands, and Playground Games has confirmed that there will be at least one Barn Find hidden this way. Better keep your eyes peeled. Before hitting a ramp and being taken into the next season, I drove across what’s essentially a mini Horizon Festival built on the ice lake itself. Quite bizarre, but certainly an incredible sight. You’re likely already aware that Seasons will change on a weekly basis. They’re a global event that take place for all players in Forza Horizon 4. One week you’ll be chasing sheep across fields in Summer, the next you might be drag racing on an ice lake in Winter before eventually blasting through deep, deformable mud in Spring during the middle of a rain-shower. Speaking of Spring, that’s the next part of the Forza Horizon 4 E3 demo experience – and it places you right into the middle of an extreme Showcase event. 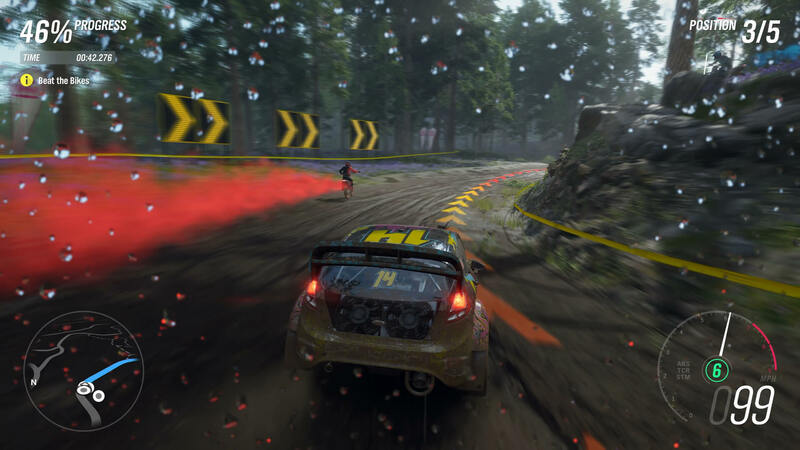 Previous Horizon titles have had jets, trains, hot air balloons, zeppelins, and even powerboats – but in Forza Horizon 4, you’ll be driving yet another off-road tuned beast in the Ford Fiesta ST Rallycross through the all-new, deformable deep mud. That’s a brand-new surface type in Forza Horizon 4, and it looks and feels as incredible as it sounds. Oh, and that ice lake we just drove over? Well, it’s no longer frozen – and the mini festival site located there has also disappeared. Your opponent – or opponents, as I should say? A team of stunt motocross racers in off-road dirt bikes. As you drive through the Lakehurst Forest, these stunt bikers will be taking jumps, pulling off death-defying flips and they even have coloured smoke coming out of the back of their motorbikes. This aspect of the demo was very impressive in Dolby Atmos as the whereabouts of each bike could by pinpointed by their direction of where the audio in the room was coming from. 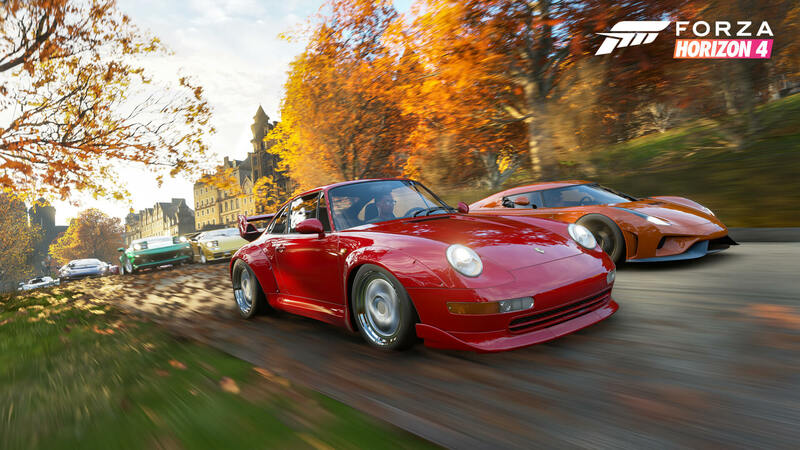 It’s truly impressive and remarkable technology to say the least – and combined with the 4K and HDR visual offerings in Forza Horizon 4, not to mention all the neat little visual bells and whistles Playground Games have added since Forza Horizon 3, it’s fair to say that visual and audio nerds alike are in for a real treat with this one. 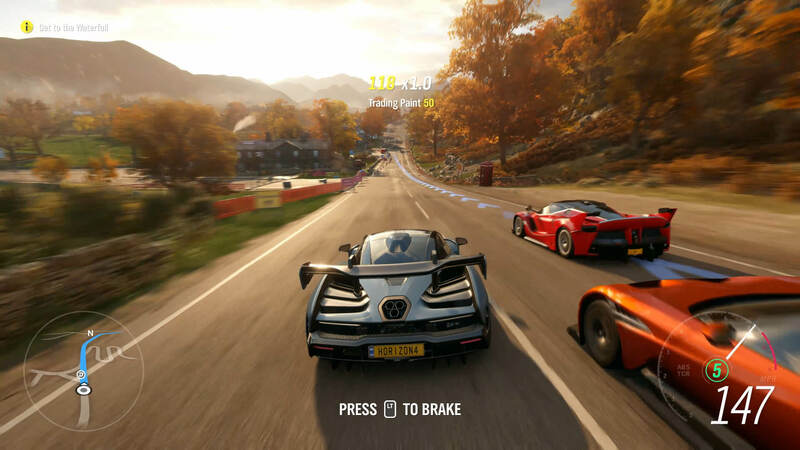 The final stretch in Forza Horizon 4’s E3 demo sees you back in the McLaren Senna as Spring turns to Summer and you push ahead towards the finish line at the Horizon Festival. You’ll hear the familiar voice of the Horizon Radio DJ as he encourages you to push forward, though if you’re like me, you’ll instead be taking in the sounds of all those other exotic supercars around you – which as you can imagine, sounded incredible in Dolby Atmos. It’s like almost seeing a bunch of supercars having a shootout, it’s quite remarkable to say the least. Being back on the warm asphalt meant the Senna could do one thing – let its 4-litre twin-turbocharged V8 engine rip and roar down the British countryside as jets resembling the Red Arrows flew above me and unleashed coloured smoke into the sky. The final stretch saw me drive through the forest-filled countryside that leads into the village of Broadway in the Cotswolds before heading back out onto the wide country roads surrounded by freshly-ploughed fields. Because it’s Summer, farmers have harvested their crops, sheep have been sheared, and the fields are all well-trimmed. At this point of the demo, I also began to observe the British road signs, which if you’re from the country, offer a lot of familiarity to them. The surroundings were also recognizable – even though I had never travelled through this part of the country. Before crossing the line at the festival, the jets returned to cover the sky in their extravagant red, blue and white smoke. Before we move on, it’s worth pointing out that the Autumn and Winter segments of the E3 demo follow a similar path. In fact, some of the route is identical – you’re just heading in the opposite direction, but it’s not something that many people noticed. It shows how the differences between Seasons is just vast. Instead of Autumn leaves covering the asphalt with reddish deciduous trees all-around you, there’s snow and ice all over the pavement in a dark, stormy Winters night where the trees have withered and lost all their flourish. You’d be pushed to recognize similarities beyond the tarmac. It shows that seasons really do change everything in Forza Horizon 4, and the E3 demo certainly highlighted it. Summertime has always been when the Horizon Festival would typically take place, but now it’s an all-year-round celebration that never ends. Fireworks and lights can be seen regardless of the season. Be it Spring, Summer, Autumn or Winter, the Horizon Festival will always be beaming in Forza Horizon 4 with cars, music and freedom at the center of everything you do. With the E3 demo, I experienced a year’s worth of British seasons in only a handful of minutes – all with pristine and resounding audio quality delivered via Dolby Atmos surround sound. All contained within a smaller segment of the open-world map that felt vast and alive with Dynamic Seasons creating the most diverse driving terrain ever seen in the Forza franchise. You’ll be able to experience it all for yourself later this year in native 4K resolution with High Dynamic Range on the Xbox One X and Windows 10 PC when Forza Horizon 4 launches globally on October 2nd. It’ll also be available day-in-date on Microsoft’s Xbox Game Pass subscription service, and Ultimate Edition owners can start playing four days early from September 28th. Whilst seasons may be the headlining new aspect of Forza Horizon 4, there are plenty of other features to be excited about as well. These include the Race Route Creator, which will allow players to create their own race routes with custom-placed checkpoints, as well as selectable weather and seasonal conditions to share with the wider Forza community. There’s also a robust set of character customization options for clothing, accessories, and emotes. These include various dance moves and salutes, including the iconic dab. 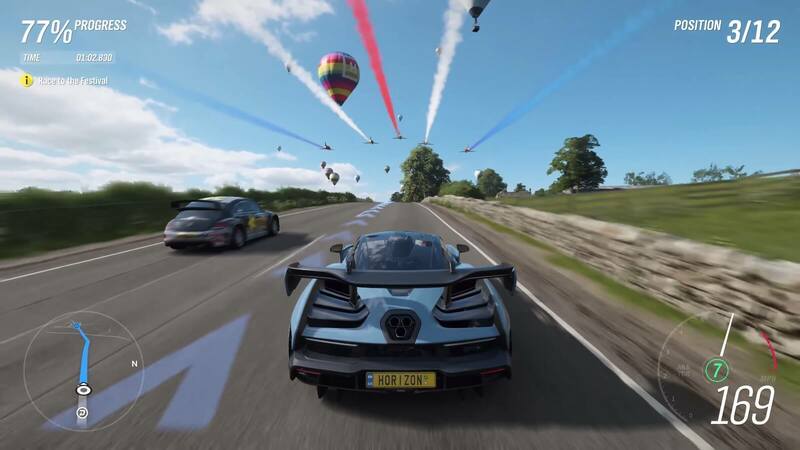 Combined with the new purchasable properties and the job-focused Horizon Stories, plus the return of the wheel-less cockpit camera introduced in Forza Motorsport 7 – not to mention the fact its more fluid than ever before with the new optional 60fps mode for Xbox One X owners, there’s a lot of new features to discover in Forza Horizon 4. Featuring a collection of more than 450 exquisitely-detailed Forzavista cars from over 100 manufacturers, including some eccentric British motor classics mixed with innovative supercars and drift machines, Forza Horizon 4 is one not to be missed by the automotive obsessed. Be it the shared open-world experience with the entire online community or the all-new seasons integration that evolve the game’s beautiful and richly-detailed British landscape, Forza Horizon 4 is shaping up to be yet another triumph in Playground’s acclaimed open-world racing series.